Hola Guatemala! A new day, a new country! We crossed the border between Belize and Guatemala, taking a private van, before driving on towards Tikal. It's not far from the border, but sits near a vast lake, Lake Peten Itza, where we stopped for lunch at El Muelle restaurant. The lake stretches out as far as can be seen, and you can walk down from the restaurant for a swim while waiting for your order. They also have a swimming pool, if the lake is too cold or green, which most of us opted for. 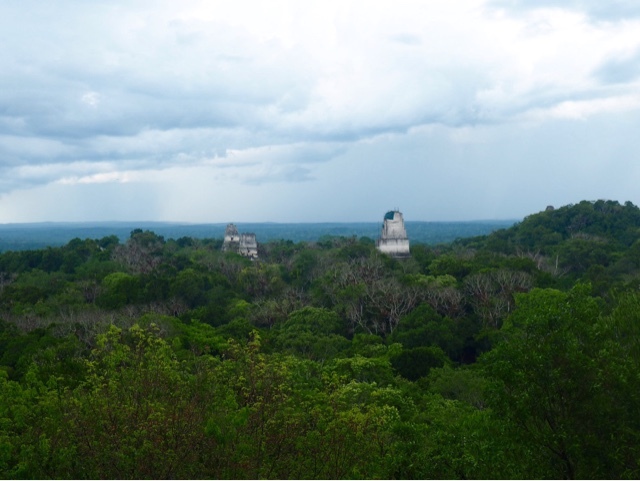 Then we drove into Tikal National Park, where we would be camping for the night. Or "glamping" as our tour manager said, since we had modern, waterproof tents, and access to hot showers and the hotel restaurant. We took a tour of Tikal with a guide, Juan, who was a treasure trove of information, and clearly very passionate about Mayan history. 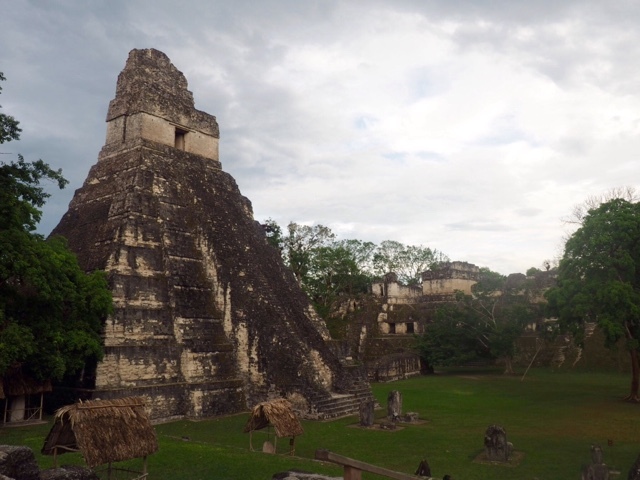 Tikal is stunning, when you remember that these structures were home to a civilisation over a thousand years ago. Many of the structures are still buried under vegetation, and would take years to uncover, but you can see where they are. The jungle is also home to plenty of animals, that you'll hear, if you don't see them. We also got caught in our first tropical rainstorm of the trip! We climbed all the pyramids and temples we could, but temple 4 is easily the most impressive. It's the highest, and you find yourself sitting above the treetops, looking out on the other temples. And if this view looks at all familiar, it's because it was used for a scene in Star Wars, a fact I was pretty excited about! We had dinner at the hotel next door, Jaguar Inn, as it was really the only option. Then we set up a camp fire, which took a while to get started, but was great once it got going. Music, beers, and toasted marshmallows! In the morning, the howler monkeys woke us all up at 4am, but this was fine, as we were heading back into the park to climb temple 4 again. It faces east, so people go early to watch the sunrise. Sadly, it was too cloudy for us to see much, but it was still pretty amazing to sit atop this magnificent, ancient structure, watch the sky get lighter, and listen to the jungle waking up. 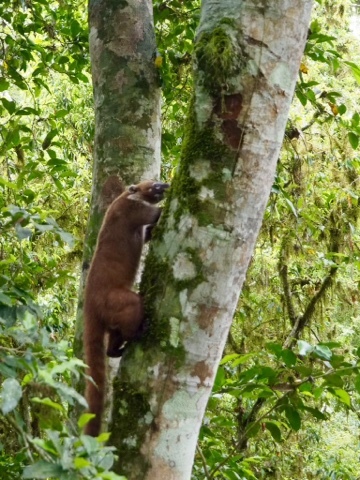 We saw plenty of the animals too; howler monkeys, spider monkeys, toucans, parrots, woodpeckers, and coatimundi. We packed up and left the site that morning, stopping at a place called El Arbol for breakfast, a cute, colourful roadside cafe. The next stopover was in Rio Dulce, a few hours drive away, again by private van. 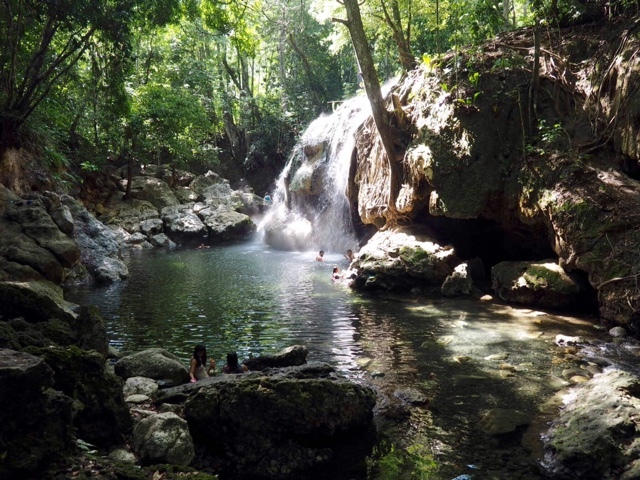 However, we stopped before then to spend the afternoon at a waterfall with a natural hot springs. It was absolutely beautiful! The river is cold, yet the waterfall is hot, and you can see the steam coming off of it! There's a tiny cave space behind the falls, which creates a natural steam room. And the mud from the top of the falls is a great skin treatment, so we covered ourselves like mud monsters, then left it to dry like clay on us, before jumping back in the river to wash it off. Our tour manager also made us guacamole, right there by the river, to eat with the snacks we brought for lunch. 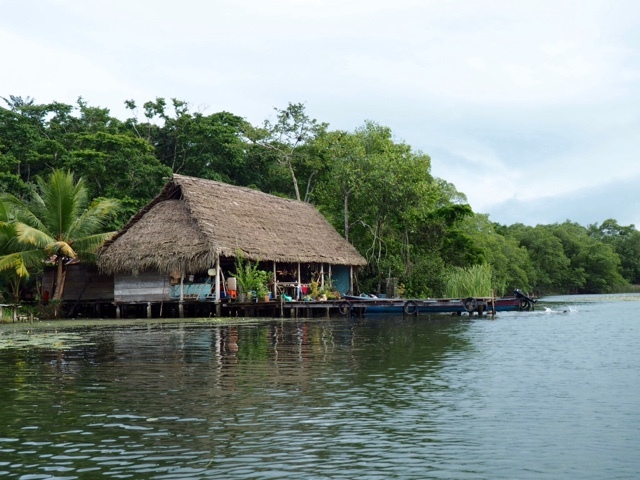 When we arrived in Rio Dulce, we had to take a boat to our hotel, Tortugal, as it sits right on the side of Lake Izabal. It looks like a wooden hut, with huge eaves, and lots of boats moored around it. Myself and some of the other girls weren't even staying in a room - we got beds in a treehouse-like structure, just down the dock, which was very exciting! We had to climb a staircase, and the beds sit right in the eaves, with no walls at all. I loved it! We had dinner at the hotel, since we'd have to take a boat back to town for anything else, then an early night, since we'd been up so early back at Tikal! For the full day in Rio Dulce, we didn't really see the town, since our guide says it's pretty small. Instead, we took a boat ride all the way down the lake, back to the ocean. We passed the fort on the way, and heard about the history between Belize and Guatemala. The journey was on a speedboat, but still took a while, and on the way we passed the local communities, with their wooden houses and canoes, and passed through a canyon of jungle and waterfall. Once we hit the coast, the boat took us to Playa Blanca, a beach inaccessible by land. 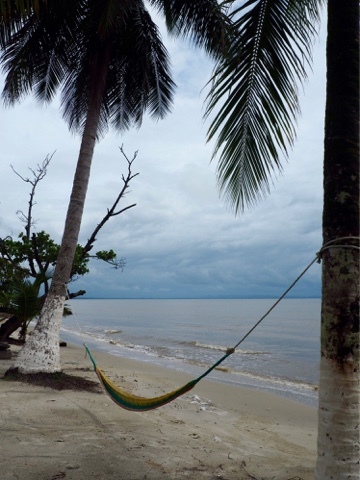 We were almost the only ones there, and it was very easy to while away a few hours in hammocks under palm trees, looking out to sea. It was cloudier than it has been so far, since we're now in the tropics, but that doesn't make it any cooler! We tried 'Coco Loco' there, where they make a hole in a coconut, pour out a shot of the water for you to drink, then replace that with a shot of rum, for you to stir up and drink straight from the coconut - delicious! The second stop from the boat was the town of Livingston, also inaccessible by land. We stopped for lunch at the Happy Fish restaurant, which was pretty good. One thing I noticed is that there are definitely fewer English speakers here than we've seen so far! Luckily our guide can translate. She took us for a walk through the town, showing us different regions, and telling us about the history of the place. It was certainly busy, full of people and traffic, and coloured buildings and market stalls. On the way back inland on the boat, we stopped at another hot springs, this time on the edge of the lake. Sulphuric water flows out the rocks, creating pockets of very hot water amongst the cold, so we had to keep mixing it all together. We also got caught in another rain shower on the way back, but it did create some lovely rainbows! Eventually we landed back at the hotel, where we had dinner again.